YOU HAVE TO TAKE THIS BUS BEFORE IT'S TOO LATE!!! 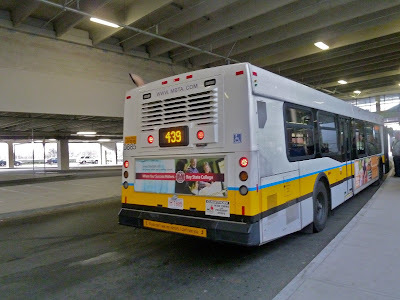 The MBTA is bound to get rid of the 439. It used to run six times a day in each direction, but the MBTA shaved off a trip recently, so it's only five now. 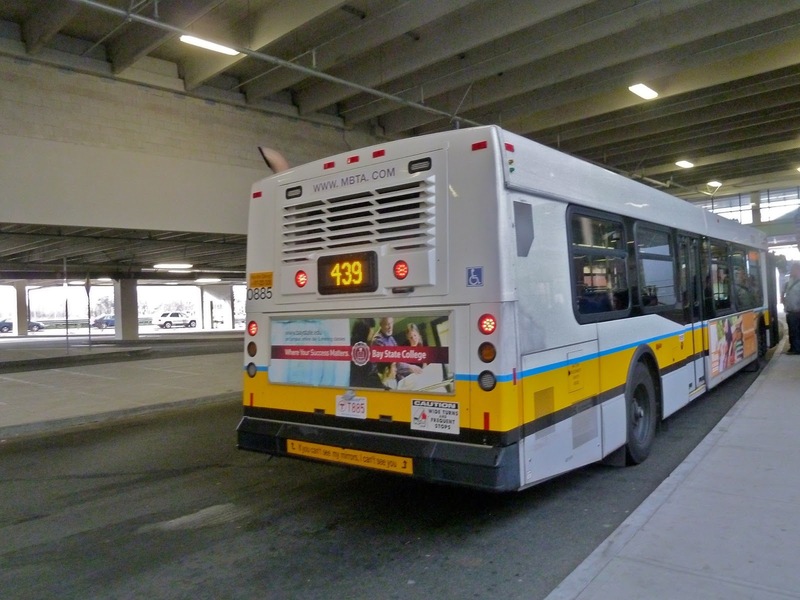 It costs the MBTA $9.76 per passenger to operate (according to the MBTA Route Performance Indicators chart), and is the most expensive bus route to operate on the entire system. The nice driver on our bus even said that an MBTA worker was taking notes on the bus, which is never good. It's a shame that the bus is done for, as it provides one of the best views on the system. Me (looking at the full-system map in the shelter): "Wow, this looks like an interesting bus. It goes onto this island-like thing." My friend who knows nothing about transit: "Oh, is it a Duck Boat?" No, it is not a duck boat, however it isn't unlike being in a boat. 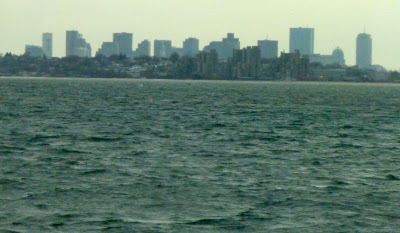 Nahant is basically an island, but it's connected to Lynn by a natural (according to Wikipedia) "tombolo," or causeway. The causeway is very thin, meaning you're essentially surrounded by water on the bus ride. Needless to say, it looked fun. Unfortunately, my father and I had never gotten the chance to ride it until we finally both had a free day. Looking over the schedule, I saw that there was a 2:00 bus and a 5:30 bus (the other trips were too early or too late). The 2:00 bus would leave from Lynn, which would be a hassle to get to, but the 5:30 bus would leave from Wonderland Station. That would be much easier to get to, plus it would still be bright out, so we opted for that trip. After waiting for about 45 minutes around Wonderland (we were early), the bus finally came. I was expecting no one to get on, but the bus was actually half-full leaving Wonderland. The bus traveled on North Shore Road, where no one got on or off. This leg of the ride in itself was scenic, with the bus going by a swamp and riding over a bridge. North Shore Road becomes the Lynnway, where the bus pulls off to serve downtown Lynn. At the Commuter Rail station, about half the bus got off and two people got on. Okay, so the destination board on the bus said "NOT IN SERVICE," so I assumed it wasn't the 439, but then it said "439" and I couldn't get the camera out in time so the result is this picture of the back of the bus. After leaving the Commuter Rail station, it serves a little residential neighborhood in Lynn not served by other buses. Only seven people were left on the bus after this stretch. The bus then turned onto the causeway. On the left side of the bus, there was a beach bordered by some tall grass, but on the right, there was a fantastic view of the city. It really felt like we were in a boat, and the bus went very fast. Two people got off at Wilson Road, serving Little Nahant Island. Once getting to Nahant proper, the route makes a loop around before going back up to Lynn. Even here it was scenic, with many unique houses along the route. Some of them have boats right in their front yards! Nahant is mostly residential, but we did pass such points of interest as Nahant's only school, the town library, the town hall, and the "Village Store." (an actual stop name) My father and I were the only people on the bus going back to Lynn, and the driver asked us if we meant to be on the 439. We talked about how we like exploring bus routes around the system, and the bus driver said that he would drive the 439 all day if he could; great views, and no traffic to boot! He also mentioned that the 441/442 to Marblehead offer views to rival Nahant, so that's a trip to consider. Arriving back at Lynn, we got off and immediately hopped on a 442 back to Wonderland (yes, it was coming from Marblehead). So even if the headways are a bit spaced out (okay, a lot spaced out), the ride is completely worth it because of the breathtaking views. Besides, the MBTA is bound to get rid of this first chance they get, so take it while you can. This picture doesn't do justice to the view, but it looks much better if you click on it. Ridership: You can tell from the schedule that the route is designed for commuters; a trip in the morning goes to Wonderland for subway service to Boston, and two trips at night come from Wonderland for subway service back. However, none of the people on our rush-hour trip seemed to be commuting. In fact, they all seemed to know each other and be friends. Pros: I've been ranting about it this whole post, but I'll say it again: the views. They are simply amazing. Cons: The schedule is just terrible. I mean, I see why it runs so infrequently if it costs the MBTA almost 10 bucks per passenger to operate, but five times a day, weekdays only? Maybe if it had summer-specific Saturday service, people would use it to get to the beach. Also, the entire stretch from Wonderland to about the beginning of the causeway, the 439 gets absolutely no signage at all. Doesn't this confuse people a bit? Nearby and Noteworthy: I think this bus is noteworthy in itself, but the driver assured us that Tides Restaurant at Wilson Road offers good prices and amazing pizza. I've looked at the online menu, and I think it looks reasonable and very good. Perhaps driving would be a better way to get to it, though, since you do not want to miss the 439. I really wanted to give this bus a 10. It's just that... I can't. The schedule is just so bad. I mean, how can it cost the MBTA almost 10 bucks per passenger when there were at least 20 people on the bus? Do they not count the Wonderland portion? I don't know, but you should absolutely take this bus if you have a free weekday, before the MBTA gets rid of it. Latest MBTA News: ALL MBTA SERVICE IS SUSPENDED while they track down the person who set off the Boston Marathon bomb (please pray for those who were injured). I've been on this bus. It really is a beautiful sight. Thanks for posting this in spite of all that has happened. It's refreshing and nice to have a release from this horribly sad week.